The rains have started and once again I have dodger and bimini envy BAD. I tried to use the sun cover to protect the boat but without a mast and boom to hold the fabric off the cabin top, the boat looked like a stepped on cupcake. And getting on and off the boat was as unpleasant as slithering under a heavy sheet of wet plastic. At midnight the first night of the storm the wind kicked up enough to get me out of bed and blearily grab the stuff sack for the boat cover. I was stuffing away and wondering why it was so hard to get the sloppy wet material into the bag. Then I noticed that I was trying to put it into one leg of a pair of pants that I grabbed by mistake. Austin has hit a plateau with his mobility improvement. He still walks gingerly and stiffly. That changes when he sees a squirrel, but he pays for his adrenaline rush later with aches. The wheelchair is supposed to arrive on the 23rd but the weather may not be accommodating enough to let us try it out right away. Austin is getting cabin fever and prefers napping in the car during the day just to get out of the boat. Cartoon by Mitchell Rose. 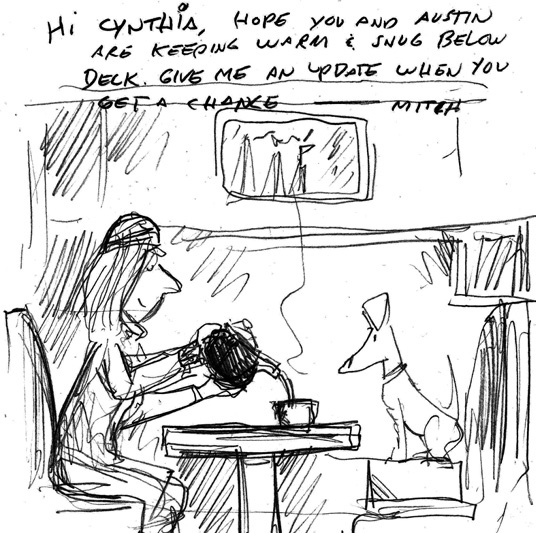 He and his dog Mitzi met us the day Austin wound up in the emergency room. I’m reassembling the mast in anticipation of getting it back on the boat. It is a puzzle. The previous owner used mismatched bolt sizes for some of the fittings. I took notes but no photos. I’m liberal with the Lanacote. It smells like you’d expect – sheep wool. And it feels good on my dry hands. This entry was posted on Sunday, December 19th, 2010 at 5:52 pm and is filed under Boat Improvements and Crew and Guests. You can feed this entry. You can leave a response, or trackback from your own site.